JAKARTA (Reuters) - Indonesia's two presidential candidates pledged to achieve energy self-sufficiency by boosting the use of bioenergy, particularly fuelled by palm oil, to cut costly oil imports by Southeast Asia's biggest economy. Indonesia, the world's biggest palm oil producer, has been pushing for all diesel fuel used in the country to contain biodiesel to boost palm consumption, slash fuel imports, and narrow a yawning current account gap. 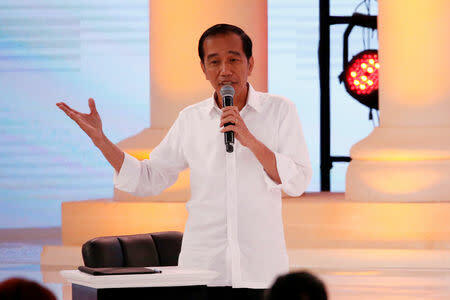 In a televised election debate, President Joko Widodo said if he won a second term the government planned to implement a B100 programme, referring to fuel made entirely from palm oil, after last year making it mandatory to use biodiesel containing 20 percent bio-content (B20). "We hope 30 percent of total palm production will go to biofuel. The plan is clear, so we will not rely on imported oil," Widodo said, adding that Indonesia's crude palm oil production had reached 46 million tonnes a year. Agreeing on the importance of bioenergy for self-sufficiency, his opponent Prabowo Subianto said if elected he would also "boost the use of palm oil, palm sugar, cassava and ethanol from sugar (cane)". The challenger did not elaborate on his bioenergy plan, but his campaign team has proposed using millions of hectares of degraded land to cultivate palm sugar to produce energy. Widodo's government has previously said it would offer incentives for developers of B100, which the net oil importer hopes can replace fuel imports within three years. Oil imports have contributed to Indonesia's widening current account deficit and the volatility of the rupiah currency. The government claimed that its biodiesel programme would save billions of dollars in diesel fuel imports. 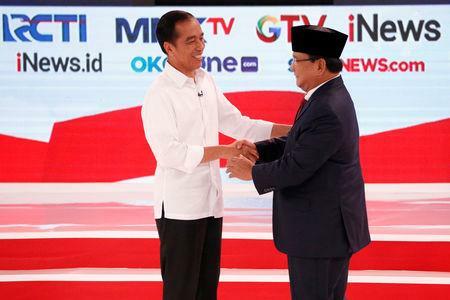 Although retired general Prabowo agreed with Widodo on several points during the debate, he said Indonesia's "land and water, and the resources within" must be controlled by the government. "We are of the view that the government must be present in detail, thoroughly, firmly and actively to correct inequalities in wealth," he said. The challenger said the proportion of small farmers' holdings in the country's palm plantations should also be larger. Smallholders currently account for roughly 40 percent of Indonesia's 12 million hectares of palm oil plantations. Farmers currently do not require larger plots of land, but instead, they need a programme to boost yield from their current farm, Mansuetus Darto of Palm Farmers Union said. He added that farmers wanted more clarity on Widodo's B100 programme and have asked to ensure that small holders play a greater role in the biodiesel supply chain. "This is an important task for Jokowi on how to prevent big palm companies to be the only main suppliers and not farmers," Darto said, referring to the president's nickname. Meanwhile, environmental group Greenpeace criticised both candidates for failing to ensure that the biofuel programmes they promised will not cause further erosion of forests, peatlands and mangrove, due to potentially higher demand for palm oil that is mixed with the fuel. By 2030, the global demand for biofuels would reach 67 million tonnes from the current 10.7 million tonnes, which could potentially result in 4.5 million hectares of deforestation and 2.9 million hectares of mangrove disappearance, Greenpeace said. 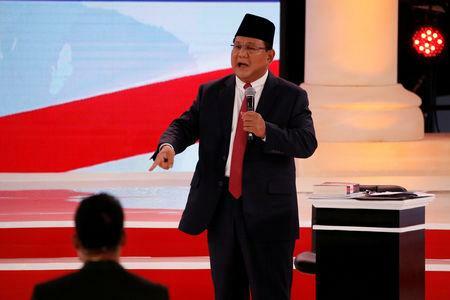 Both candidates expressed support for greater control of Indonesian natural resources. President Widodo highlighted Pertamina's takeover of stewardship of major oil and gas blocks from foreign operators, and an agreement for a state company to purchase a 51 percent stake in the giant Grasberg copper mine from Freeport McMoRan.